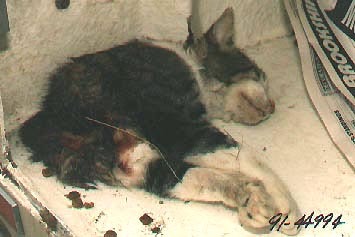 Half cat mutilation photograph provided by the Plano, Texas Police Department in a 1991 case, similar to recent cat and dog mutilations reported in Salt Lake City, Utah; Aurora, Colorado; Saratoga and San Diego, California; and Austin, Texas. May 27, 2003 Salt Lake City, Utah - Since May 14, 2002, the Salt Lake County Animal Services in Utah has received nine reports of mutilated cats and one report of a mutilated dog. The May 14th case was a domestic male cat with black short hair. The officer who picked it up thought it might have been attacked by another animal, but the resident who found it thought its throat had been slit.